The internationally acclaimed Chinese State Circus is returning to its roots in a spectacular new production – ‘Dynasty’. The group will be playing at Savile Park, Halifax from Tuesday 19th to Monday 25th September in a fully heated big top venue. Promising to be “breathtaking in its simplicity”, ‘Dynasty’ projects into a contemporary setting an art form that has thrilled audiences for more than 2,000 years, where low-tech everyday objects are transformed into hi-tech acrobatic equipment. There will be hurtling porcelain jars, dynamically spinning plates balancing upon gigantic pyramids of tables and chairs framed by the delicate strands of silk supporting cascading aerialists. 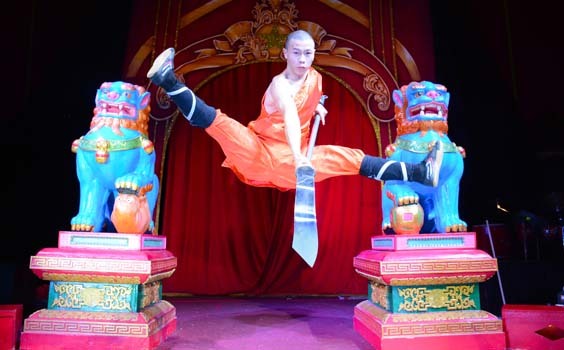 World class Chinese acrobats, aerial artistes and jugglers interact with the super-human physical skills and dexterity of the masters of martial arts – the legendary Shaolin Warriors. The nonstop action from start to finale is set to a soaring musical score accompanied by the rhythmic beats of Chinese percussion. The outstanding acrobatics are performed live in front of an audience in what has earned the Chinese State Circus the accolade “incomparable”. There are no gimmicks, no tricks, no fakes and no retakes.